The process of puffing grain is a very old one. The oldest known examples were discovered by archaeologists in New Mexico. This earliest puffed grain was popcorn, which has been around for at least 4,000 years. Early popcorn was smaller than what we know today, with a popped piece roughly the diameter of a US penny. Other grains were never really puffed until much more recently. The next puffed grain to appear was invented in 1901 by Dr. Alexander P. Anderson. Dr. Anderson experimented with grains of corn starch, exposing them to heat and pressure in test tubes. He heated these grains in an oven, and later cracked them, which caused them to explode into small puffs. This was the invention of puffed cereal, which would be introduced to the world at the St. Louis World’s Fair in 1904, billed as “The Eighth Wonder of the World”. Sure, it’s grain—now with air! Since Dr. Anderson’s invention, puffed cereals have become a standard in the American diet. Hundreds of different puffed cereals line supermarket shelves today, with familiar names like Rice Krispies, Kix, Cocoa Puffs, and Honey Smacks. Many other brands have come and gone over the years. Few remember Happy Jax, introduced by Post in 1948. Those who do remember it are more likely to know it as Sugar Crisp, which Post renamed it the following year. 1950s Sugar Crisp cereal ad. Walk down today’s supermarket cereal aisles and you’ll see many puffed cereals, with recipes that haven’t changed much in a half century or more. One thing you won’t see is the word sugar, which has been scrubbed from the names of most, if not all, American breakfast cereals. Early promotions of cereals touted them primarily as a breakfast food, but also as a snack food, and sometimes as candy. Sugar Crisp’s early advertising showed that Post saw no conflict in calling something a healthy breakfast food and candy at the same time. The public didn’t seem fazed by this, either. Sugar Crisp (later renamed Super Sugar Crisp) was always marketed toward children. Its first packages featured the Three Bears on it (but quickly reduced it to one bear). This bear was always called Sugar Bear. Sugar Bear’s early personality was more that of an eager child, but in 1965, he was given a turtleneck, a new voice and a new personality. Voiced by actor Gerry Matthews, Sugar Bear sometimes sounded more like Bing Crosby, sometimes more like Dean Martin. Post Sugar Crisp box with the first appearance of the new Sugar Bear, 1964 (left), and the more familiar version, 1965 (right). The television commercials were successful, but in 1964, Post tried something new. Working with Ed Graham Productions, CBS, and General Foods, a new Saturday-morning cartoon called Linus the Lion-Hearted was launched. Linus was just one of five characters who appeared in the lineup for this ensemble series. The characters were actually Post cereal mascots, promoting five different cereals, including postman Lovable Truly for Alphabits, young boy and offensive Chinese stereotype So Hi for Rice Krinkles, and Sugar Bear for Sugar Crisp. The show was a half-hour collection of cereal ads, with time out for commercial breaks. Linus produced 39 episodes over two seasons, and then sold the show to ABC, who aired it in reruns until 1969. The show was a successful advertising gimmick—too successful. The reason ABC took it off the air was because it had to. The FCC ruled in 1969 that TV shows couldn’t have advertising mascots as their characters, so that was the end of Linus. Linus the Lionhearted record. Listen to Linus with all his cereal-mascot friends. 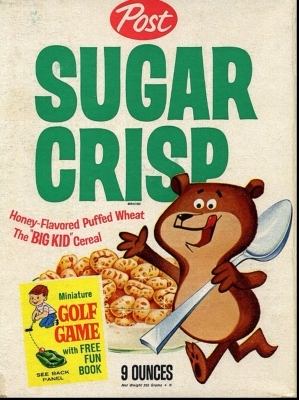 Advertising for Sugar Crisp was picked up by Jay Ward Productions, which had produced TV cartoon hits like Crusader Rabbit, Rocky & Bullwinkle, and George of the Jungle. 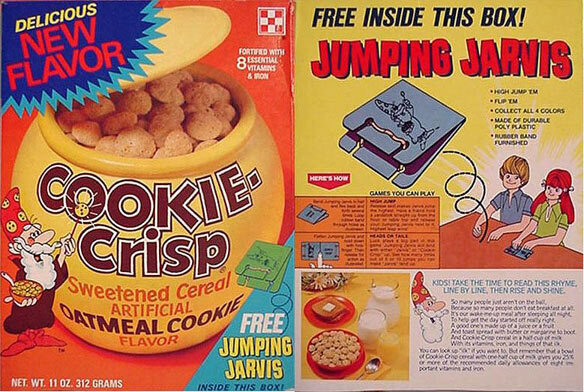 Jay Ward made dozens of cartoons for Sugar Crisp (as well as Quisp, Quake, King Vitamin, and their most famous mascot, Cap’n Crunch) through the 1970s, seeing the brand into the Super Sugar Crisp name. Around this time, events would require a new name change for Super Sugar Crisp. In 1977, research done by dentist Ira L. Shannon showed that a number of breakfast cereals were made mostly of sugar. This should come as no great surprise where some are concerned. Super Sugar Crisp has sugar in its name, and had never tried to cover that up (though it had been a while since it promoted itself as candy). The highest sugar content of any breakfast cereal on the market was Fruity Pebbles, which was 55.1% sugar. Cocoa Pebbles was second, at 53.5% sugar, followed by Honeycomb, at 48.8% sugar. Super Sugar Crisp was actually in fourth place, a mere 40.7% sugar. For context, a Milky Way candy bar is 28.8% sugar, and soda pop a mere 4.2%. Hey, kids! Cookies for breakfast! The lawsuits, in the end, did not bring these brands down, but they did bring about change. Cereals (and all other products) are required to state on the packaging just how much sugar they contain, which is why this information appears on packages today. Another result was a number of cereals dropping “sugar” from their names. Sugar Puffs became Golden Puffs. Sugar Smacks became Honey Smacks. Sugar Chex ceased to exist. And Super Sugar Crisp became Super Golden Crisp. Same bear, same recipe, same sugar content, but now with accurate labeling. Sugar Bear has not disappeared. He was never renamed, and Post doesn’t try to cover up his name. But if you go to Post’s website today and check out the history of Golden Smacks section, nothing states that the cereal was ever called anything but Golden Smacks. Remember: if you’re eating these cereals and you want to cut down on sugar, just have a candy bar instead.